Why is Forgiveness in Marriage So Hard? Is there an attachment science of forgiveness in marriage? What is forgiveness in marriage? Is it possible…or even desirable? In this post, I’m going to discuss the essential axis of intimacy; trust and betrayal. The success or failure of intimate relationships depends on these factors. Forgiveness is the mitigating force. Contrary to popular belief, forgiveness is not necessarily a predictable or natural process. It’s helpful to think about forgiveness as either “positive” or “negative.” In positive forgiveness, the hurt partner, with the offending partner’s aid, endures and eventually overcomes the initial shock of betrayal. They work with their offending partner toward a greater mutual understanding and empathy. This deep unpacking of the circumstances surrounding the betrayal helps to reduce anxiety and repair the marital bond. Active affair recovery is a classic example of “positive” forgiveness. On the other hand, researchers Finch, Hall, and Beach (2006) have described a process they call “negative forgiveness.” Negative forgiveness in marriage is merely paying lip-service to the notion of forgiveness. In negative forgiveness, the memory of the spouse’s offense is wielded as a blunt instrument, present and available for immediate use when convenience beckons…during an unrelated marital conflict. Gottman describes one kind of negative forgiveness as inconsolability. Why is there such a difference between positive and negative forgiveness in marriage? Researchers Gordon and Baucom (1998) tell us that when a behavior that is serious enough to warrant forgiveness in marriage (let’s call this behavior a “betrayal” as a shorthand), it becomes a profound violation of relational norms and expectations. Because of the unexpected experience of betrayal, the hurt partner’s world is in utter disarray. “How could you do this to me?” is the mantra of the betrayed, hurt partner. Attachment science tells us that all partners have internal working models which have been carefully constructed with their spouse interaction by interaction over time. When betrayal is revealed, the internal working model of the hurt partner is under siege. This becomes an emotionally traumatic experience. There is a continuum of responsibility in these internal working models. Some hurt partners firmly believe that their betraying partner is uniquely and singularly responsible for the betrayal. Forgiveness is utterly off the table because they can never be trusted again. Sometimes this rigidity is culture-bound. The hurt partner’s family-of-origin usually sheds light on this firm and unyielding stance. For these hurt partners, forgiveness in marriage is neither possible or desirable. They have decided that their offending spouse is bad to the bone. One thing we don’t have is a shortage off is clinical research declaring the benefits of positive forgiveness. Positive forgiveness is a path to growth in a relationship. We find that couples who can achieve and sustain a positive forgiveness experience greater marital satisfaction, better conflict resolution, greater intimacy, and, perhaps most importantly…greater mutual empathy (McCullough et al.,1998; Fincham & Beach, 2002; Fincham, Beach & Davila, 2007; Finkel, Rusbult, Kumashiro & Hannon, 2002; Gordon, Baucom & Snyder, 2005; Mikulincer, Shaver, & Slav, 2006 and Worthington (2005). Everett Worthington, a professor of psychology at Virginia Commonwealth University and a clinical psychologist, wrote what is perhaps the definitive evidence-based book on the subject, Forgiveness, and Reconciliation. Hurt partners find it impossible to forgive when they have mental real estate generously taken up by one or more of the “three N’s”; narcissism, neuroticism, and negative emotions. Hurt partners can reach empathy for their betraying partner by humbly acknowledging their own distinct contributions to the relationship’s breakdown. Once this is achieved, they can more readily reach a state of positive forgiveness in marriage (Gurman, 2008). Attachment styles are critical here. Hurt partners with a secure attachment style can eventually enter a more profound dialogue with their partner. They are capable of achieving higher levels of compassion and empathy than hurt partners with a dismissive-avoidant attachment style. These hurt partners are far less able to forgive because their internal working model requires them to maintain their fragile self-esteem by keeping their partner in the perpetual dog-house (Kachadourian, Fincham & Davila, 2004). Hurt partners with an anxious attachment will tend to ruminate excessively. Peluso (2007) has shown that persistent rumination interferes with forgiveness in marriage. The reasons why anxious attachment interferes with forgiveness in marriage is because the degree of separation anxiety in these hurt partners can be profound, as is their inner struggle with bouts of rumination. The separation anxiety thwarts the processing and resolution of anger, resulting in a seemingly perpetual state of fear. I’m not saying that these hurt partners with anxious attachment aren’t capable of forgiveness in marriage. 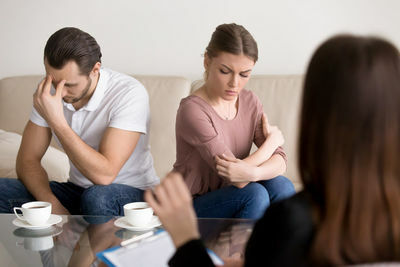 What I am saying is that for hurt partners with anxious attachment, whatever degree of forgiveness in their marriage that they can attain is often fraught with ambivalence, insecurity, and anxiety (Gillath, Mikulincer, Birnbaum, & Shaver, 2008). I like to look at forgiveness as a tool for deeper intimacy. Any discovered or disclosed betrayal results in an emotional uncoupling. At the nadir of the betrayal, neither spouse feels seen, heard or understood by their partner. They emotionally uncouple. And they each suffer in their separation. But if and when the desire to forgive emerges from the fog of violated expectations, it can offer a chance for deeper and more profound intimacy. Forgiveness is a mutual process. The offending partner rebuilds trust with transparency and shares the pain of the broken trust with their hurt partner. At the risk of sounding overly simplistic, the hurt partner tells the offending partner what they need to rebuild trust…and the offending partner gives it to them. These are twin-tasks for reconnection. Positive forgiveness in marriage can lead to eventually becoming “stronger in the broken places.” But how do we approach the notion of forgiveness in marriage with hurting couples in science-based couples therapy? Researchers Feeney and Monin (2008) describe the 5 tasks required to experience positive forgiveness and heal from the attachment injury of betrayal. Self-Regulation. The hurt partner must not only be able to self-regulate, but they must also desire to do so. Intense emotions can be managed, and the management of emotions must be privileged along with developing understanding and empathy for the offending partner. Understand Your Offending Partner. Understanding your offending partner does not absolve them of responsibility. But if you’re going to ask “how could you do this to me?” sincerely, you have to stick around in a self-regulated state to fully hear the answer. Your partner may have a point of view that may be profoundly different from your own. Resolving your feelings with the facts of the situation may be a painful and challenging process. The goal is to acknowledge the different wants and needs that you both have. Some of these wants and needs may have been ignored or marginalized for years. Check for Ghosts in the Room. Are there stories or people from your past that are shaping how you see this betrayal? Who are the people from your past who are silently whispering to you? What are the perceptions, expectations, beliefs, and values that are quietly shaping your suffering and anguish over this issue? What Do You Both Want Instead? Hurt partners who can enter positive forgiveness use the betrayal as a springboard to deeper intimacy. That means emotional space must be created to allow something new to be born. How can this crisis not go to waste? Can your suffering have meaning? Superficial, negative forgiveness will keep the offending partner in a perpetual “one-down” position. It may take a while, but eventually, they will wriggle free, and your marriage will most likely end. 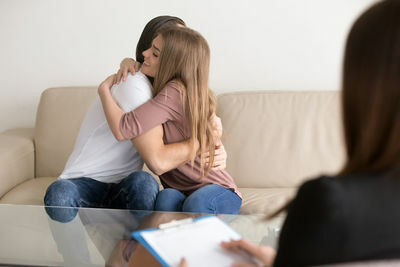 Authentic, positive forgiveness involves the two of you sharing a narrative of connection, disconnection, and re-connection. You have to dare to care… to repair. It takes courage and vulnerability. But perhaps the most significant difficulty is for the hurt partner to become curious about what happened in a less self-focused, and a more balanced and more empathetic view of the offending partner. A balance between attachment and differentiation is realized. The ability to repair and not sweep issues under the rug. Conflict-avoidance is now seen as a problem, not as a virtue. A new found skill in self-regulation and co-regulation. The achievement of understanding essential differences, and the ability to manage those differences with skill. Spouses with a secure attachment will have the most comfortable experience in couples therapy finding and maintaining this balance. They will also have an easier time with periods of conflict and discord and will be more readily able to make repair attempts when needed. Partners who demonstrate a pattern of anxious attachment will privilege harmony and connection over all things. Because they can’t easily tolerate periods of conflict, they will tend to protest more often than repair, exhausting themselves and their partner. Perhaps most challenging of all are spouses who tend toward an avoidant attachment style. Research tells us that men are often socialized with this style of attachment. It is mostly the reverse of the anxious attachment style. While the anxious attachment style pursues harmony, often over understanding, the avoidant attachment style leans toward distancing behavior. They not only tolerate moments of disconnection, they often seek to create them as a way of calming themselves down. The “guy code” encourages men to be uncomfortable expressing attachment needs, and sees these needs as a source of weakness. They also are uncomfortable when their partners communicate those needs as well. Attachment styles are the roadmap to forgiveness in marriage, and attachment science continues to inform the best practices and interventions used in science-based couples therapy. The good news is that attachment styles are malleable. They only feel like they are written in concrete. Couples that can enter positive forgiveness “grow themselves up” in the process. Couples that attain forgiveness in marriage see when they are out of step with one another. They can tolerate the reality of desiring different things and can work together to restore a healthy balance. They finally come to realize that conflict is an unavoidable part of intimacy. It’s not perceived as a threat but as an opportunity to understand one’s partner at a deeper level. Positive forgiveness is a source of intimacy and relational strength. But it’s a stubborn and pervasive cultural belief that if you forgive your spouse, you’re somehow condoning their behavior. Forgiveness in marriage is a significant indication that you are still capable of goodwill toward your partner. Research indicates that forgiving your spouse is an essential pathway to personal growth and healing (Worthington, 2005). Forgiveness is a dynamic process. It means bestowing a future free of anger and resentment on yourself, your spouse, and perhaps most importantly, your children, who may be a captive audience to your bitterness and resentment. Do You Want to Achieve Forgiveness in Marriage?